Introduction: A cornerstone of building the social work profession, Mary Richmond was known for her ability to organize communities, her development of casework practice, as well as her ability to teach and speak intelligently on a wide array of subjects. It was Richmond who systematically developed the content and methodology of diagnosis in the period around 1910. Her first principle was that care had to focus on the person within their situation. Building on extensive research, she developed what she labelled ‘social diagnosis’. Her famous circle diagram visualized the correspondence of client and environment. Richmond identified six sources of power that are available to clients and their social workers: sources within the household, in the person of the client, in the neighborhood and wider social network, in civil agencies, in private and public agencies. This is a precursor of the system theory that was so popular in 1970’s social work. 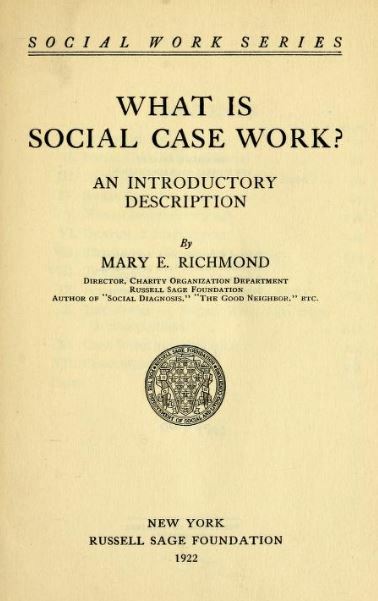 With her book Social Diagnosis (1917), Mary Richmond constructed the foundations for the scientific methodology development of professional social work. She searched for the causes of poverty and social exclusion in the interaction between an individual and his or her environment. For her contributions, Mary Richmond is considered a principle founder of the profession of social work and the importance of professional education. Mary Ellen Richmond was born August 5, 1861 in Belleville, Illinois to Henry Richmond, a carriage blacksmith, and Lavinia (née Harris) Richmond. On the death of her parents while she was very young, Richmond was raised by her maternal grandmother and two aunts in Baltimore, Maryland. Her grandmother, an active women’s suffragist, was known as a spiritualist and a radical. Richmond grew up surrounded by discussions of suffrage, racial problems, spiritualism, and a variety of liberal religious, social, and political beliefs. This upbringing promoted critical thinking and social activism in her. Richmond’s grandmother and aunts were also not fond of the traditional education system so Mary Richmond was home schooled until the age of eleven when she entered a public school. Social interaction or relationships were not her strong point and she spent considerable time reading literature. She graduated from high school at the age of sixteen and went with one of her aunts to New York City. She took a job at a publishing house doing a variety of clerical and mechanical tasks, a very difficult life with twelve-hour workdays. Her aunt soon became ill and returned to Baltimore, leaving Mary on her own at the age of seventeen. After two years in New York, Richmond returned to Baltimore and worked for several years as a bookkeeper. During this time, she became involved with the Unitarian Church and developed her social skills as she met new friends. Richmond applied for a job as Assistant Treasurer with the Baltimore Charity Organization Society (COS) in 1889. The Charity Organization Societies in several cities were the first organizations to develop a structured social work profession, providing social services to the poor, disabled, and needy (especially children). The genesis of the Charity Organization Society (COS) movement had its roots in urbanization and the loss of “community” and mutual aid prevalent in rural areas. By their very nature, early urban areas fostered industrial accidents, diseases, unemployment, poverty, family breakdown and other social and economic problems. When afflicted by unemployment, sickness, old age or a physical disability, individuals and families without relatives nearby or financial resources had few options: apply for public relief, appeal to private charities or beg help from strangers. The problems of dealing with urban poverty increased significantly when a city suffered an economic depression, labor strife or some other event that left large numbers of able-bodied men and women without a source of income. A vast number of independent groups and organizations had formed to ameliorate the problems of poverty caused by rapid industrialization, but they operated autonomously with no coordinated plan. The primary emphasis of the COS movement was to employ a “scientific” approach to cope with the expanding problems of urban dependency, the proliferation of private philanthropies and growing evidence that some individuals and families had learned to “game” the system by successfully appealing to multiple organizations for help. The overall purpose of the charity organization societies was to bring order to a disorganized and ineffective system of alms giving by churches, charitable agencies, and individuals. “The Need of a Training School in Applied Philanthropy.” By Miss Mary E. Richmond, Secretary Charity Organization Society, Baltimore, Md. A few years after this speech, Miss Richmond accepted the head administrative position at the Philadelphia Society for Organizing Charity. Then, in 1909 she made her final move and left Philadelphia for New York City to become the director of the Charity Organizational Department of the Russell Sage Foundation in New York in 1909. With the support of the foundation, she helped establish networks of social workers and a method by which they did their work. She also began publishing her ideas in books (such as Friendly Visiting among the Poor, Social Diagnosis, and What is Social Case Work. At the Foundation, Richmond conducted research studies such as “Nine Hundred Eighty-five Widows” which looked at families, their work situations, the financial resources of widows and how widows were treated by social welfare systems. Within her published books, Richmond demonstrated the understanding of social casework. She believed in the relationship between people and their social environment as the major factor of their life situation or status. Her ideas on casework were based on social theory rather than strictly a psychological perspective. She believed that social problems for a family or individual should be looked at by first looking at the individual or family, then including their closest social ties such as families, schools, churches, and jobs. Finally, casework would then look at the community and government dictating the norms for the person/family to help determine how to help the person or family make adjustments to improve their situation. Richmond also believed in focusing on the strengths of the person or family rather than blaming them for being bad. Much of her focus was on children, families, and medical social work. She concentrated on the community as being a resource for any needy person or family. Her ideas on social work were quite revolutionary for the time and have made a resurgence after decades of an approach which blamed the person for their problems. These ideas are now the basis for current social work education. Mary Richmond’s lasting impact on the field of social work comes from her deep commitment to ensuring families received appropriate services. Trained as a friendly visitor, she sought to fully understand the problems poor people dealt with and to train her staff to work with families in a structured manner. She felt that professionalization of the friendly visitors would mean that poor families would receive better treatment and therefore improve their circumstances. Richmond worked directly with families in the charity organization, but also as an advocate on the national stage. In addition to her advocacy to professionalize social work she also helped to lobby for legislation to address housing, health, education, and labor. She paid special attention to issues concerning the welfare of children and women. Her book, Social Diagnosis (1917) was the first comprehensive introduction to social casework that spoke to both the theoretical aspects and practical application of the profession. Her other works include A Study of Nine Hundred and Eighty-five Widows (1913), What is Social Case Work (1922), Child Marriages (1925), and Marriage and the State (1929). These writings represent a broad range of experiences and lessons that she learned from her day-to-day work as well as the practice and research of her social work colleagues. For more information: The Mary E. Richmond Archives of the Columbia University School of Social Work. From Charity to Social Work: Mary E. Richmond and the Creation of an American Profession, Agnew, Elizabeth N., University of Illinois Press, 2004. Social Work and Social Welfare: An Introduction, 3rd Edition. Heffernan, J., Shuttlesworth, G., and R. Ambrosino. St. Paul, MN: West Publishing Company, 1997. “Crafting a Usable Past: The Care-Centered Practice Narrative in Social Work,” Hiersteiner, C. and K. Jean Peterson. Affilia (1999). Richmond, Mary Ellen (1908). The good neighbor in the modern city. Philadelphia: J.B. Lippincott. Thanks for catching the mistake. I’ve made the correction.